Make a date in your diary for “Three Choir Special”, a gala concert at Holy Trinity Church, Worcester Road, Link Top, Malvern. 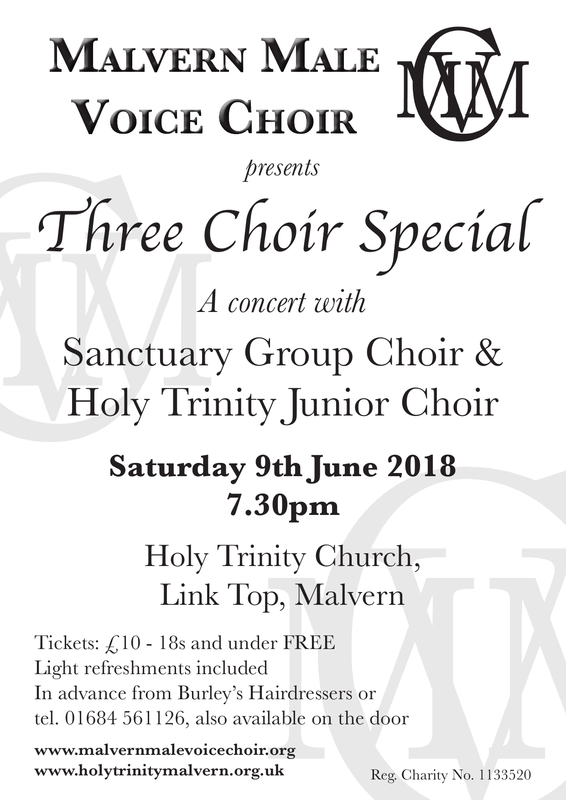 Starting at 7.30 p.m. on Saturday 9 June 2018, Malvern Male Voice Choir is teaming up with the Worcester-based Sanctuary Group Choir and Holy Trinity’s own Junior Choir. The wide ranging programme will include many choral favourites. Sanctuary Group Choir and Malvern Male Voice Choir were originally due to perform together in March, but the performance was cancelled when “The Beast from the East” met “Storm Emma”. So now, with three choirs on the same evening, expect a packed and varied programme with music from six musicals including Les Miserables, songs from TV and film, a few pop favourites, as well as two Welsh male voice choir standards and something composed in 1595. Tickets cost £10 (18s & under free), include light refreshments and can be bought in advance from Burley’s Hairdressers in Great Malvern or by phoning 01684 561126. Tickets will also be available on the door. Proceeds will be in support of Holy Trinity Church.